February Contents: Pesticides or Pollinators? - It's OUR choice!........and More Feb topics: The 'Darling Buds' of February..... Early February marks the mid-point of winter.... Fruit trees suitable for polytunnel growing..... Reminder to order seeds now - if you want a tunnel full of healthy veg next winter!... How to afford the 'luxury' of protected polytunnel cropping?.... Will you have 'Extra early potatoes' for Easter?.... Winter watering.... Waking up our soil friends after winter.....Start sowing early seeds in modules.....What are 'Blind seedlings' that don't develop?.....Sowing early peas and broad beans in pots..... Early spring has already arrived in the tunnel - and I wouldn't garden without one now! Pesticides or Pollinators? - It's OUR choice! 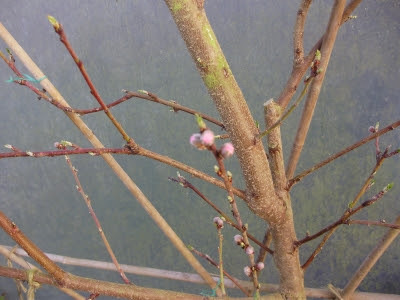 The early buds of early fruit trees are now starting to swell in gardens everywhere. Soon all gardeners will be hoping for plenty of bees and other pollinating insects to pollinate our crops, so that we will have plenty of healthy food to eat later on. This is something which we have all been lucky enough to be able to take for granted since the beginning of human life on earth - but now we cannot take it for granted any longer! Intensification of agriculture, with it's use of vast amounts of fossil fuel-derived pesticides and fertilisers is destroying insects, habitats and all the vital, inter-connected biodiversity which depends on them. Those chemicals are also increasingly destroying soil health and soil carbon - with the result that soils globally are releasing massive amounts of CO2. THIS is happening while so much of those crops produced by industrial agriculture go to waste! The pro-chemical people constantly promote the idea that organic farming couldn't possibly feed the world's growing population. The reality is that because organic farming both protects and improves soils, and also biodiversity, it is actually far more sustainable in every way. Instead of saying that we can't feed the world without intensive agriculture and pesticides - why don't scientists come up with solutions for preventing the almost 40% of all food produced globally which is wasted throughout the food chain every year? Then tell us that we can't feed the world organically - as Nature has done for billions of years! I read some interesting research recently which said that if we cut out all food waste - then we could feed another billion people tomorrow. But even if we stopped all food waste now - if we continue to destroy our soils and pollinating insects with pesticides, there will be mass starvation anyway! Firstly there would be be no soil left to grow crops in, and in addition, many of the valuable crops like fruits, nuts and seeds etc. would have no insects to pollinate them. Healthy crops also depend on a microbially-healthy, humus-rich soil in which to grow - otherwise all plants are more susceptible to pests, diseases and the increasing fluctuations of the weather. Few people seem to be warning that plant growth will also naturally be affected by climate change. This is something I have been warning about for well over 30 years - as I could see those climate fluctuations happening before my very eyes, even then! It was obvious that was what was causing the weather to swing wildly from unseasonably mild, almost spring like weather too early in late winter, back to sudden, seriously damaging weather with bitter, unexpected frosts. One didn't have to be a scientist to see what was happening - but many concerned scientists were warning back then that global warming wasn't going to be lovely Mediterranean-like weather that some were hoping - but the wild and unpredictable weather patterns now happening worldwide. If you're a regular reader you will know much of this already - because I've been banging on about this for years! But if you're a new reader, interested in organic alternatives to the current mess we're in - you are most welcome. Here is the evidence of what I personally, and many other organic farmers have been warning about for decades. Yesterday a very concerning article was published in the Guardian newspaper. It warned that according to the first ever comprehensive global scientific review, the world's insects are hurtling down a path towards extinction, threatening a "catastrophic collapse of Nature's ecosystems"! The analysis found that more than 40% of insect species are declining - falling by a precipitous 2.5.% each year, with a third now critically endangered. Their rate of extinction is eight times faster that that of mammals, birds and reptiles. A terrifying statistic - since insects are the foundation of life on Earth, and they are essential for the proper functioning of all the Earth's ecosystems. They are the unseen recyclers of nutrients, food for other creatures and also vital pollinators for our food. Pesticides are without question the primary cause for the rapidly accelerating decline of bees and other pollinators, along with loss of habitat. The ubiquitous neonicotinoids and the fungicides they are often combined with are particularly harmful - as they affect the bee's sense of direction and ability to forage. I won't bore you with explanations - there's enough information about them out there now. Neonicotinoids don't just affect bees - but other insects and biodiversity like soil and aquatic life as well, and are so persistent that they remain in the environment, in soils an water for a long time. What seems to occur to very few people is that all of these pesticides affect creatures with which we share our most basic, evolutionarily conserved DNA. In other words - the evolution of life on earth gradually built onto those first, early foundations. But we still retain those genes deep within our DNA, and we are just as affected by pesticides as insects are - except the effects show far more slowly - beginning at a genetic level. The combined effects of eating foods containing all of these toxic pesticides have been tested very little - if at all - but what few studies there have been, show that they are many times more toxic when present in the combinations in which they are routinely used on, and residues found in, the food we eat. Science has virtually no understanding of how those combinations then interact in our bodies, but even individually many are known to be endocrine-disruptors, or in other words - disrupting all the basic metabolic systems of our bodies. And that disruption is, after all, exactly how they kill insects! . In my opinion all pesticides should gradually be banned completely, worldwide, starting urgently with the most toxic, in order to give farmers time to adjust - and adjust they will have to! They could easily convert to sustainable and regenerative organic farming within 3 years if they wanted to - after all, organic farmers do! And organic isn't just applicable to small farmers - there are many examples worldwide of very successful and productive large organic farms! We really have no choice, we need bees and other insects. They are vital to crop pollination and ultimately - not just to mankind's survival, but also the rest of Nature. The multinational chemical companies don't care - they're focused on providing a fat profit for their shareholders. For some years they've been putting millions of dollars into farming bumble bees - what they see as their latest sick business opportunity! But bumblebees bred for pollinating commercial crops in greenhouses won't save entire ecosystems. As I wrote last year - "We are not just poisoning our soils with pesticides, but also our pollinating insects, and every other creature on the planet. They are the canaries which are being sacrificed in this giant 'coalmine' that is our planet's ecosystem. We see the effects of pesticides and other chemicals on insects and smaller elements of biodiversity long before they gradually affect us, because their lives are far shorter and we see the effects on them more quickly - but don't be in any doubt that by poisoning them we are also ultimately poisoning ourselves! Organic gardening and farming restores soils, and helps to preserve natural ecosystems and the health of all biodiversity - as it tries as far as possible to mimic the way that Nature has grown things since the beginning of life on earth." People on social media often scream at me that organic is more expensive - and I know that is the case in many instances, since we buy whatever we can't produce ourselves. But that is a political choice - made by those public representatives who continue to support the huge taxpayer-funded subsidies given to damaging conventional farming. If those who are polluting our environment and damaging public health had to pay the true cost of cleaning up that damage, and the health costs of cancer and other non-infectious diseases, or NCDs - then conventionally, chemically-grown produce would be massively more expensive. In addition, there is the ultimate cost of loss of biodiversity, planetary health and climate change - how do you put a value on those? These are all being caused, or accelerated by our use of fossil fuel-derived chemicals. All to produce, as I have already said, the 40% of food which is wasted, going to landfill and emitting climate-changing greenhouse gases. What are we doing? As for the rest of us non-scientists - we cannot just eat non-organic food and then say - "How dreadful it is that our bees and other insects are disappearing" - or - "How awful it is that the climate is changing", when anyone who eats non-organic food by choice, rather than due to unfortunate economic necessity, is knowingly contributing to this catastrophe! Is it any wonder I am so angry? The facts have been known for many years - but so many people selfishly choose to ignore them!..... And as for those scientists who are defending the use of GMOs and pesticides - and in particular defending their use on social media - if any of them are reading this, which I doubt - then I utterly despise you! You are the lowest of the low and beneath contempt! And as far as I'm concerned - you belong at the very bottom of the toxic chemical cesspits which are of your making! We are now faced with a choice.... And it's up to us to make the right choice - if we want life on earth as we know it to continue, and our children and grandchildren to have a future. That's not being melodramatic - it is the stark, absolute truth which we now face! We can no longer ignore it. Politicians must step up to the plate quite literally, end the age of fossil-fuelled chemical farming, and put organic food back on global plates. To do otherwise is not simply irresponsible and selfish but will, quite simply, destroy life on Earth! Back to more cheerful matters! Spring is fast approaching to cheer us all up - isn't it exciting? I can already see all of Nature responding to the lengthening days as weed seeds are germinating in the tunnel soil and the buds on the apricots and peaches in the polytunnel are swelling fast as you can see above. No matter what the problems in the world are - plants still want to grow and seeds want to sprout! Buds are beginning to move everywhere. Every day more of the early spring bulbs are beginning to peep out of the chilly wet ground and the Robin's loud singing starts at least ten minutes earlier each week. But winter isn't done with us quite yet - so take care - and don't be fooled into thinking that Spring's arrived just yet! Don't be too impatient to start planting stuff outside though, however tempting it may be on the milder days. There's a lot we can get on with indoors - enjoying the anticipation before the work becomes too urgent! One thing which really helps to ensure indoor fruit pollination is to grow single flowers as early food for insects! As I mentioned last month - flowers are vital for attracting bees into your garden - as well as many other beneficial insects which help with both pollination and pest control. I've often mentioned the little permanent ,mini gardens, which I grow at the end of the tunnels - in the corners either side of the doors - where space is so often wasted or taken up with junk. I also have flowers planted in the middle at the sides too - and anywhere else I can tuck them in. These little 'mini gardens' have flowers all year round to attract bees etc. and mini pond habitat to attract frogs. They also have piles of large stones - little mini cairns - for ground beetles etc to hide in. Ground beetles are voracious predators of slugs.These little mini ecosystems are vital in helping to achieve a natural ecological balance within the tunnels which ensures that I never have any pest problems. I also allow clumps of nettles to grow here and there - these play host to an early appearing aphid - specific just to nettles - which are the favourite prey of ladybirds that are just waking up in spring. Growing row upon row of green juicy vegetables - without a flower in sight either inside or outside - is not a natural environment. They make your crops a target for every hungry pest in sight! Why would any self-respecting pollinating bee or pest controlling hoverfly visit your vegetable garden if there are none of their favourite flowers and food plants there to attract them? They have to go wherever they can find nectar and pollen or they may die. It's only common sense that if you're starving hungry and have to find food for energy within a few hours or die - you'll head for somewhere there's plenty of food on offer - you won't go to the gym or the solicitors will you?!! If you don't have anything flowering in your tunnel - you can bring some in in pots of flowers - hellebores, perennial wallflowers (like 'Bowles' mauve'), miniature narcissus, crocus, primroses, perennial Iberis or candytuft, etc are all good insect attractants. Feverfew and Hesperis (dames violet) are also flowering now. In fact anything that flowers now is useful - the only requirement is that they must be single flowered - It's impossible for bees and hoverflies etc. to reach the nectaries and pollen in double flowered plants and at this time of year in particular - they may waste precious energy trying to find food and then may die if they can't. Despite the cold nights things are already starting to put on a surprising amount of growth. Joy Larkcom's beautiful Chinese brassica, Orychophragmus Violaceus (bit of a mouthful! ), which the Chinese call the 'February Orchid' (much nicer), is living up to it's name and opening it's first flowers. Seeing it in Joy's County Cork greenhouse a few years ago completely stopped me in my tracks - it was absolutely stunning in early March! I just had to have it - and she was kind enough to give me some seed. It has quite large flowers for a brassica, which are that lovely soft lilac-pink colour of sweet rocket. 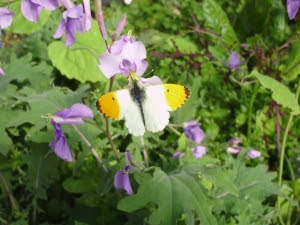 Sadly no scent though - but nevertheless the bees love it and it's a firm favourite with endangered orange tip butterflies, as this photograph from spring 2011 shows. So it deserves a place in any garden just for that reason. It would certainly be worthy of a place in any flower border. I've picked lots of leaves over the winter, and they're pleasant tasting in a salad, with a slightly 'cucumbery/cressy' flavour - not very strong and have quite an interesting texture. The flowers are really pretty in a salad too, again they have a slightly 'cress-y' taste but they look so lovely it's almost a shame to eat them. I'll be saving seed again this year as it's very hard to obtain and I find it germinates best from fresh seed - but I do know that currently Brown Envelope Seeds in Cork have them. The beginning of February marks the mid-point of winter - half-way between the shortest day and the spring equinox. It's also the time when the ancient Celtic calendar marked the Festival of Imbolc - or the 'Feast of Lights' - which celebrated the returning of light to the earth and the beginning of the end of winter. An important day, this pagan celebration of light - which was seen as being both healing and life-giving. In Celtic times people rejoiced to see the sun returning just as we do today - but they understood how dependent they were on nature - an awareness that many of us seem to have lost now. They knew how vital the sun was to their lives and just how much they depended on those primitive seeds they had harvested so painstakingly the previous autumn and guarded so carefully all winter. They were totally in tune with the rhythm of the seasons and the forces of nature. Those of us today who are gardeners or nature lovers still feel the rise of that age-old visceral thrill of anticipation, and experience the same sense of celebration at the anticipation of longer days and delights to come. It truly connects us to our roots, both physically and metaphorically. My two late 'rescue' dogs - Flotsam and Jetsam - were real sun-worshippers! Immediately even the weakest rays of sun showed they would rush outside and arrange themselves to maximum effect against a south facing wall. Just like eager tourists dashing for the sunbeds - in order to catch every available scrap of precious sunlight! Our two new rescue pups do just the same! They love to be outside all day if the weather's fine - occasionally tearing around playing and then flopping down onto their bale again! I hate to think of all the poor creatures that are left on their own all day, shut in up houses away from sunlight. All creatures have a desperate need for light and an innate sense of just how important the sun is. This particular animal (me!) makes a point of spending some time every day outside in the light, no matter how busy I am in the house. The sun feels surprisingly warm on one's face sitting in the polytunnel even at this time of year. The fast-growing chicks have been enjoying it for the last couple of weeks in the polytunnel, and now since their move to their 'grown-up' quarters they are luxuriating in the frosty sun in their warm scratching pen/conservatory! As for me - I love to sit in it - but I find I can rarely sit for very long as there's always some needy job that catches my eye! In the last week or so there's really been an amazing surge in the growth of some of the plants - despite the cold weather! Plants know what time of year it is from the light just like all of Nature does - and they are ready and primed to start their yearly cycle once again. All the tunnel salads have really responded to even the small amount of increased light! The Oriental salads are positively burgeoning - the watercress in particular - growing at least six inches in a week! It's such a wonderfully reliable salad all year round, just needs regular watering - not running water - contrary to what some say. The only thing that makes it unhappy is being very short of water, which makes it flower. Then it becomes stringy, tough and very peppery - but bees really love the flowers though! If you only grow one salad - then do try growing it! It grows like a weed, from just a bit of stem stuck in a jar of water, comes top of the list for healthy nutrients and is chock full of immune-boosting, cancer-fighting phytonutrients such as sulforaphane. My watercress, like my kefir, is something I rely on and have kept going for many years. I was so thrilled to be able to gather lots of it's luscious leaves yesterday for a lovely fresh-tasting salad. My hens also really enjoy disposing of any old salads lingering in the fridge. There's never any food waste here! Fruit trees suitable for polytunnel growing. 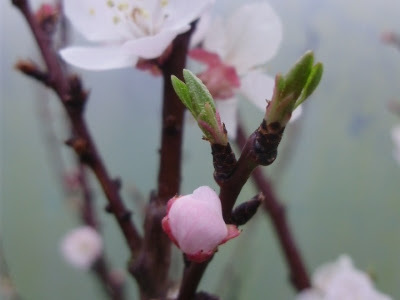 This morning I noticed a tiny hint of movement in the buds on the peach trees planted in the ground in the polytunnel - despite the low temperatures we've had recently. I'm so looking forward to their luscious fruits again and meanwhile carefully eking out the last of the frozen and dehydrated ones. Peaches, along with grapes, strawberries and of course figs are very easy to grow in polytunnels if you have enough space. My two 7 year old peach trees provide masses of fruit every summer now. I love peaches and it's well nigh impossible to get organically grown ones. I always cut up the excess and freeze or dehydrate them for smoothies, sorbets or other treats. I think that peaches are the very best fruit tree to plant in a tunnel if you have space for only one tree - they're usually self-fertile and are easily kept within bounds by correct pruning. If you forget for a year, you can hack the hell out of them and they'll still come back for more - but if you aren't brave enough and don't prune them - they'll quickly outgrow any polytunnel or greenhouse and seriously threaten the roof! The really great thing about growing peaches in a tunnel is they don't get peach leaf curl - so don't have to be sprayed with any nasty fungicides. One of the other great things about peaches is that because of the way they are pruned - you can keep them to what ever height and width you want. So as long as you have roughly 15ft or 3m of width - you've got room for a productive peach tree. It's vital to prune them properly though - and remember that they mostly fruit on the previous year's new green growth, as I described in this January's Fruit Garden Diary. Soon both Lidl and Aldi will have bare root fruit trees on sale again. At around a fiver each - they're fantastic value and in my experience are very good quality. Bare-root planting is always best with any fruit tree and I talked about that last month too. They always establish far better than anything bought in a container. The vital thing to remember is to always leave a minimum of 4 in. or 10 cm between the bulge of the graft union on the stem and the top of the soil. if you don't do that you will lose the dwarfing properties of the root stock. Other trees, particularly cherries, can be an absolute disaster, unless you have a lot of time to fuss over them - particularly in the usually damp-ish atmosphere of the average tunnel here in Ireland. They really only work well grown on very dwarfing root stocks in the specialist fruit tunnels which I've seen in Herefordshire/Welsh border - where many of my family live. Even then they need a lot of regular pruning to keep them under control. Specialised fruit tunnels have sides which can slide up, and tops that open up too - so that you get maximum air circulation and also good pollination when you need it. I'd love a specialist fruit tunnel - but sadly the finances won't stretch that far - so like most people I try to do as much as I can in one! It's so windy here that one might not be successful anyway! Over the last 35 years, I've tried all the latest dwarfing root-stocks for sweet cherries, even the 'minarette' ones, and none of them really work unless you are constantly pruning, snipping and fussing to keep them within bounds - something I really don't have time for. It's also difficult as you can only prune cherries at certain times of year - and this also happens to be the busiest time elsewhere in the garden. So take your eye off the ball at all and you'll find the cherry has lifted the roof off your polytunnel. Believe me - I've tried!. I would never recommend planting one in a tunnel. They seem quite innocuous for a year or so - and you might think - what's she talking about? But believe me - when they think you've taken your eye off them - they can take off like rockets! I've tried them in tubs too - and they're not that happy in those either for very long. On the other hand - Morello cherries, which are pruned in a similar way to peaches - can work fairly well in pots for a few years - but you'll never get huge crops from cherries in pots - and huge crops are what I always aim for! I'm a greedy fruit fanatic and the dark, sour or Morello cherries are also one of the best fruits for anthocyanins which are proven to lower inflammation and ease arthritis. A reminder to order seeds now - if you want a tunnel full of healthy veg next winter! A neighbour came to look at my tunnel the other day, and was surprised to see how great a variety of things there were to eat at this time of year. He has a small tunnel - and wanted to know how he could do the same next winter. It's really only a matter of remembering to sow seeds at the right time. Late June or July is the best time to sow many of the chicories, chards, oriental veg. etc. otherwise they don't have enough time to grow before the days really begin to shorten - when growth of many things slows dramatically. Summer is not always the most popular time to be anticipating winter though, much nicer to enjoy sunbathing instead! But gardeners must think well ahead if they want to produce food to be as self-sufficient as possible all year round food. So do remember to order seeds now of things like claytonia, chicories, endives, Swiss chards, leaf beets, sugar loaf chicory, Chinese cabbages, lambs lettuce, pak choi, winter radishes, winter lettuces, watercress and landcress (you'll find a delicious soup recipe for these last two on the recipe page). Stupidly - many garden centres tend to take their seeds off sale once summer gets under way. They think that gardeners won't want seeds then - but REAL gardeners, growing real food do! So make sure you have them. I am constantly amazed at the number of people who only get round to clearing up the remains of last year's mouldy and disease-ridden old tomato and cucumber stems or other crops now! They could have been eating delicious home-produced salads and other veg all winter......not only are they completely wasting precious and expensive cropping space for at least one third of the year - but they then wonder why their lovely summer crops almost immediately get hit by pests and diseases as soon as they plant out this year's crops.This is because the spores of fungal diseases like botrytis etc will be flying around the minute they go to clear up the mess! Any protected cropping space is so valuable - and often so hugely expensive to put up initially - that every inch of it it should be earning it's keep all year round! How to afford what some call the 'luxury' of protected polytunnel cropping? Several people have said to me in the past - "It's all right for you - I don't have a tunnel - I can't afford one - so I don't bother reading the bit about greenhouses and tunnels, because I can't do it!". - Well do you know what? For a start - you could actually grow many of the lower growing crops in a large polythene cold frame - that's what I did - long before I had my first small polytunnel. If you work out how much you spend all year round on vegetables and fruit - particularly now with food prices rising - and then compare that against the price of a small tunnel - where you could grow a huge amount of it yourself - I think you would be surprised at just how quickly it would pay for itself! Not to mention the convenience and added health benefits of absolute freshness, or being able to garden in any weather - even at night after work to de-stress!! Some of the DIY stores sell plastic-covered greenhouse frames very cheaply now - for less than €100. But if you really don't have the space for a greenhouse or polytunnel, or can't afford one, you may have a large glass porch, or you could make a polythene frame easily and very cheaply, sit it on a concrete path and grow in containers if you don't have any soil to grow in - so there's really no reason why you can't grow even a few winter salads at the very least! In something that size you could also grow bush tomatoes, peppers or aubergines in the summer. I did that very successfully when I first started gardening years ago, making up my own frame from recycled timber and polythene, and I promise you that if I can do it - then anyone can! DIY is most definitely not my thing! I grew my best peppers and aubergines ever in that rickety old recycled frame! It lasted several years too - I was very proud of myself! So please don't use the "I can't" excuse - that is, unless you don't even have so much as a path to your front door! 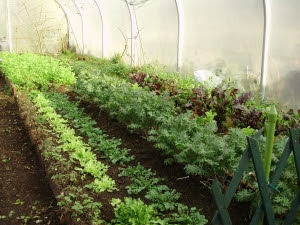 Winter salad beds in the tunnel - Endives, land cress, ragged Jack Kale, lettuce etc. One thing I can absolutely guarantee, is that when it comes to polytunnels or greenhouses - what I call my 'law of handbags'applies. That is - no matter how big your handbag, greenhouse, or freezer - it will NEVER be big enough for everything you want to put in it, once you've experienced it's delights!! So always buy the biggest one you can possibly afford - you will bless every inch of it I promise you! I'll be making a new 'grow frame' this year, for hardening-off veg seedlings to be planted outside later. More protected cropping space is always useful here because it's so windy - and in late spring, when the tunnel is literally bursting at the seams, it's a great halfway-house for hardening off plants to grow completely unprotected outside later on. Will you have 'Extra early potatoes' for Easter? Your extra early potatoes could already be up about an inch or so if you planted them as I described last month in pots. Make sure they're covered every night with fleece - even if you're not expecting frost - just in case. In the middle of this month, they may be about 10cm/4-5in. high, then you can plant them out carefully, keeping the root ball together, into a tunnel bed, covering with a double or even treble layer of fleece if severely cold nights are forecast. Or you can leave them in their pots. You'll be eating these in mid-late April! You can also plant well sprouted seed potatoes directly into a tunnel bed any time now, again covering if necessary. These should be ready to eat in May, roughly in about 10-12 weeks, depending on the variety. As mentioned in previous diaries - I've always found 'Lady Christl' to be the very best for really earlies in the tunnel, good flavoured, it's by far the quickest to 'bulk up' - one can often find usable potatoes underneath it after just 8 weeks - if you're impatient like me and do a gentle, exploratory 'finger-dig', leaving the rest to grow on undisturbed! 'Duke of York' or 'Red Duke of York' is next best for earliness (and also the best flavour of the lot), 'Mayan Gold' is only a few days after them - planted at the same time - and of course has an unsurpassed flavour - 'Apache' is a delicious early too and then 'Sharpe's Express' - 'Annabelle' is also not bad. I've tried all of the other earlies - including 'Rocket',Swift and 'Premiere' and quite frankly they were utterly tasteless compared to any of the ones I grow. Flavour is a very subjective thing however - and let's face it - given enough butter almost anything tastes good!! 'Mayan Gold' seems to be generally available now in Ireland (I smuggled mine in via my daughter's backpack years ago)! Try it and I can guarantee you will be as rapturous in singing it's praises as I am!! Never boil it or it falls apart because it's so floury - steam or roast it instead. Mayan Gold is also energy saving as it actually cooks far more quickly than normal varieties - in about half the time! Water only if absolutely necessary in the tunnel at the moment. Doing it in the morning is best if you can - as this allows any surface moisture to dry off before evening. If you're covering crops with fleece it also helps if the soil surface dries off a bit during the day or fleece tends to absorb more. I watered 3 days ago - for the first time in 3 months! Plants were wilting in the sunshine - which is getting a bit stronger now. Also ventilate as much as you can whenever possible, to keep the air moving and avoid the atmosphere becoming too damp - which encourages fungal diseases. Keep an eye on weather forecasts for very strong winds though - you don't want your polytunnel taking off into the next parish - (a story there - tell you sometime - I'll never forget losing a polytunnel in hurricane 'Charlie' in the mid 80's!). Growth of all plants will suddenly start to increase in the next week or so - thanks to the light - so you can increase watering accordingly when you need to. Also it's important now to continue scrupulous housekeeping! Tidy up any yellowing, rotting or diseased leaves etc. and also the remains of finished crops. Don't leave anything hanging around that could cause disease! If there's not much worm activity in your soil generally - then do a pH test. Worms like a pH of about 6.5 - 7 and if your soil Ph is right and worms have plenty of green food to eat - then they should be lively and pink - not sluggish and pale. If you find your soil is a bit too acid then add some calcified seaweed to gently raise the pH. You can't go wrong with this, as it's very gentle and also contains lots of other valuable micro-nutrients and trace elements. Then lightly scratch over the ground, add some nice well-rotted compost and perhaps a few handfuls of seaweed meal which worms also love. If you don't have compost then a handful per square yard of a general organic fertiliser like 'Osmo' will add more nutrients but if you've got time before the next crop planned for a particular space - maybe 6 weeks - then sowing a fast growing green manure is a really good idea. Not only does it help all the biological activity in your soil but it also adds humus which makes soils more resilient and helps them to hold onto moisture like a sponge. Even claytonia - not usually used as a green manure, is brilliant. The worms go mad for it - it's like crack cocaine for them! This will help to kick start all the biological activity in the soil as it warms up - giving the worms, microbes, fungi and soil bacteria some TLC and a welcome gourmet breakfast, just when they're starting to wake up. Interesting fact - did you know that there are more billions of microbes, soil bacteria, fungi etc. in just one teaspoon of soil - than the total number of people who have ever lived on this earth? If it wasn't for them - we wouldn't even exist!! So learn to love your microbes! Organic growing feeds the soil and all the vital microbial life it contains with compost and animal wastes just as nature does. It doesn't directly feed the plants with synthetic chemicals. That's the most important thing to remember - because if you by-pass all the microbes and funghi that evolved to interact with plant roots symbiotically and produce their by-products which keep plants healthy, you will ultimately produces unhealthy plants. A healthy, vibrant, living soil grows healthy, vibrant, nutritious plants. Healthy plants make healthy food for people. This is particularly important to remember in a polytunnel, where things tend to be magnified, things happen a lot faster, and we are totally responsible for the growing environment. To make sure I have something to plant as soon as the winter crops are finished both in the tunnel and outside, I started sowing a few early crops in mid-January. Details of what you can sow now are in the 'What to sow in Feb.' section, so I won't repeat them here. Things like onions, leeks, beetroot etc. can be multi sown in the modules - in 3's or 5's - depending on how many you want in a clump - or how big you want your onions (less in a clump for bigger onions) and they're planted out later without thinning. These will push each other apart as they grow and develop quite normally. You can do the same with summer spinach, chards and 'baby leaf' or salad mixes. 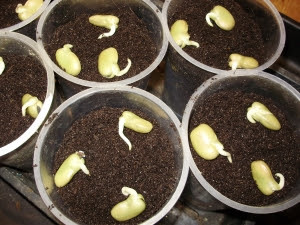 Rather than use an expensive propagator at this time of year I germinate everything near the back of my range cooker - which keep things at a steady 65-70 deg F/16-20 deg C. As soon as the first seedlings are showing they need good light, so then I put them out in the polytunnel, on a roll-out heated mat which provides very gentle bottom heat of about 50 degF/10 deg C - or just above during the day - and is very economical to run. This is all most things need to grow on nicely without forcing. In another 2 weeks in the warmer propagator I shall sow my aubergines Bonica F1, (the very best and most reliable one) these develop quite slowly at first and need a long growing season. I'll also be sowing my earliest tomatoes - Maskotka, Latah and John Baer. These are always ripe in the first week or so of June. I can't wait for ripe tomatoes again! Talking of which - there may be some very exciting news soon on the tomato front - but can't reveal it yet!! What are 'Blind seedlings' that don't develop? Occasionally there are seedlings that develop they're first seed leaves or cotyledons as they are known - but after that they don't grow any more new leaves. These are known as blind seedlings. In cases where you may only want one plant per space - like lettuces or hybrid calabrese - it's normal to thin seedlings to one per module, but only do this after they have clearly developed their first 'true' leaves - not the seedling/cotyledon leaves - as 'blind seedlings they will never develop 'true' leaves and grow on. This is quite common with brassicas and if it happens you could waste space on a seedling which will never develop any further - so don't thin them too early! With calabrese seed in particular - which can be expensive - it also wastes seed and money! I've never seen any of the 'so-called' experts telling you this - they always tell you to thin as soon as you can handle the seedlings! Over 40 years of experience (OMG can't believe it!) does actually teach one a few useful things! At this time of year - I always soak my broad beans and peas for a couple of hours before then sprouting them on damp kitchen paper on a plate covered with cling film and put in a warmish place. I always get the best germination this way. It saves the seed sitting in cold wet compost for too long and possibly rotting. 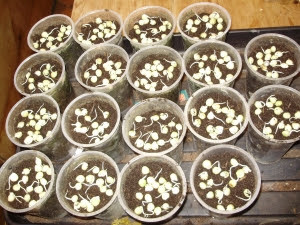 They sprout in about 2-3 days and then as soon as the 'radicle' or main tap root appears - I then sow them in large pots as you can see above (I use recycled 500 ml yogurt pots - they're the perfect size!). 3 broad beans to a pot or a small handful of peas (don't count them) per pot. I don't thin the beans or the peas as it's totally unnecessary - I've tried doing it over the years but the plants produce just the same crop per plant - so obviously crop more per sq.ft/m if on a deep, raised bed. Thinning them after germination is not only totally unnecessary, but is also time-consuming and wastes valuable seed. These potfuls will be planted out about 30cm/1ft. apart when big enough. I am always amazed at just how much better the germination is with home-saved seed. I got 100% germination of the yummy Crimson Flowered Broad Bean as per usual (good job as we've just finished the last from the freezer!). Beans and peas are the only things I cover with organic peat-free seed compost after sowing - everything else is covered with vermiculite - which promotes good air circulation and drainage around the seedling stem, virtually guaranteeing no 'damping off' disease - as long as you are careful with your watering. After sowing anything - only ever water again from underneath. This is easy to do by sitting the tray or module in a tray of water for a few seconds. And as I've often said before - if you do happen to overdo it by mistake - and we all do it occasionally - don't despair and leave them to rot in cold wet compost! It's very simple - just sit the tray of seedlings on a newspaper for 1/2 hour or so which acts like a wick to draw out the excess. All seeds need is a good seed compost, a little thought and plenty of TLC to grow - it's not rocket science! Despite all the years I've been gardening - I never cease to be surprised, delighted and full of wonder at Nature's miracle of a tiny seed and it's determination to grow. That perfect little pre-programmed parcel of DNA - full of history and priceless, unique and irreplaceable genes. And - best of all - packed with a delicious promise of healthy food! Do you know someone actually complained to me a few years ago that there's too much information in my blog?? I suppose these days everything is presented in small bites - which often leaves one with not enough information to do things properly - so then you think it's your fault when it doesn't work! Luckily many others disagree and really appreciate it - so for it's for those nice, appreciative people that I write it! I try to put on new, improved and relevant stuff each year - depending on the latest research. Although there's no substitute for experience - and you never stop learning in gardening - every year is different. I hope you find my experience useful. I can remember only too well what it was like many years ago - trying to find out how to grow chemical-free food for my very sick child! You couldn't even buy organic vegetables and fruits then! Although there is much more availability of organic produce now - it's not only much cheaper, more satisfying and far fresher if you can grow it yourself even if it's only salads - but you can also have a far wider choice of produce and nutrients by growing your own food. If you want to grow a lot of things then you need all the information to be successful. Very often gardening advice in magazines seems to have been written by people who either haven't actually done what they're talking about - or are complete novices and are just repeating stuff from old gardening books almost verbatim! That won't do any more - our climate is changing and also soil science is moving on and we are better informed than ever. Despite that though - we should never assume that we know it all - Nature doesn't give up her secrets easily! Early spring has already arrived in the tunnel - and I couldn't possibly garden without one now! As I've been saying ever since I got my very first tiny one - about 38 years ago now - 'If I only had a small garden - I would cover the entire space with a polytunnel'. I definitely think there should be government grants for back-gardeners to put them up! Just think of how much they'd save the health service with all that gentle exercise, fresh air, light and healthy chemical-free food! It's just what the doctor ordered! It's truly wonderful to be able to walk into the tunnel and feel the gentle background warmth and dryness when the sun shines at this time of year - it's so full of hope. Every time I open the door and walk into that other world, I thank the Garden Gods once again for the blessing of such a snug and richly-productive space to grow things in.